MEMBERS of Balcombe's newly formed amateur dramatic group, The Victory Players, recently took part In a short one act play entitled A Sussex Scrapbook. The play was researched, devised, written and directed by teacher Colette Randall and recreated an olden days harvest supper. The actors and singers took the parts of various actual old Sussex characters from the 1750’s to the 1940s. Among them were Grandma Hugget, the wise woman, Thomas Turner, undertaker, shopkeeper and teacher and the Rev Egerton. Two of the most colourful characters were a mountebank and a toadie who made money by claiming that the bottles of worthless potion they sold would protect people from poisoning. In their travelling medicine show the toadie would demonstrate its benefits by swallowing a live, supposedly poisonous toad in front of the crowd and pretending to die a horrible death. The mountebank would then administer his potion and appear to bring the toadie back from the dead! Mrs Randall took many of the lines in the play from primary and secondary sources using their reported speeches. She was also fortunate to have actors whose own characters often coincided with those they were playing. "It's a wonderful thing, as a writer, to have 12 people volunteering to be in your play and putting their heart and soul into it," Colette said. 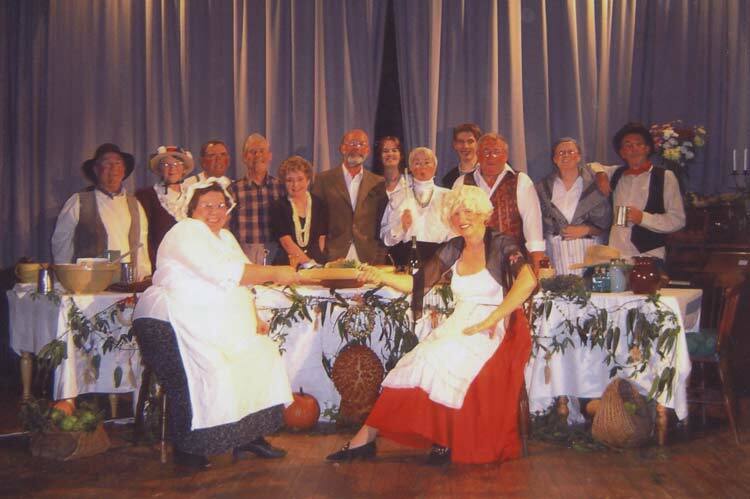 The play came about after the Victory Players were asked by St Mary's Parish Church to produce an entertainment for its annual harvest supper. The play, and the piano accompaniment by David Moore, was well received by a packed house in the Victory Hall and was repeated informally for members and friends of the Victory Players. Mrs Randall is now rewriting and expanding A Sussex Scrapbook for radio. She also hopes to do further research into the darker side of Sussex life including smuggling, the highwaymen and other activities of a criminal kind. *It threatened to kill him, till the potion it flowed. Cast: Mike Ravner, Sue Elheridge, John Bunn, Eddie Hammond, Dorothy France, Alan Dearden, Colette Randall, Glvnis Sayer, David Moore, Rodney Saunders, Jacqueline Kehoe, Chris Walker, Anthea Bell and Manuela Warburton.